Monica Melissa Patterson listens to potential jury comments during jury selection in her capital murder trial at the Hidalgo Courthouse on Wednesday, Sept. 20, 2017, in Edinburg. EDINBURG — Finances dominated the third day of Monica Melissa Patterson’s capital murder trial as the jury heard from a certified public accountant and two local bank employees. Prosecutors spent Wednesday questioning witnesses in an effort to establish a motive for Patterson’s alleged murder of Martin Knell Sr., 96, in January 2015 for financial gain. They also continued to present evidence of her alleged theft from Comfort House, the nonprofit hospice center where she served as administrator at the time. 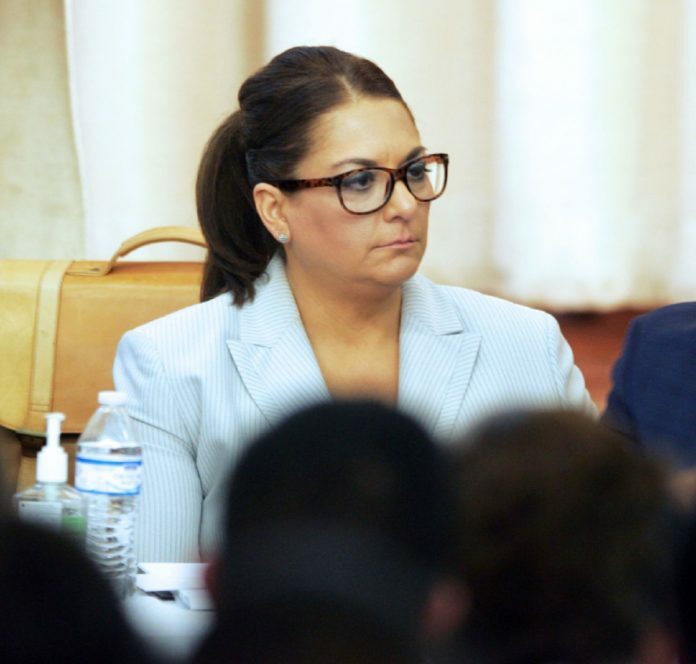 In the course of questioning Melissa Gonzalez, a certified public accountant, Assistant Criminal District Attorney Joseph Orendain revealed that Patterson had failed to provide Gonzalez’s firm with a Falcon International Bank statement. It was this account that was linked to the debit card where Patterson allegedly misused Comfort House funds for personal expenses. Gonzalez testified that an audit covering the fiscal period of July 1, 2013, through June 30, 2014, could not be considered accurate as a result of the missing account, which she described as containing “substantial” amounts in cash checks. The defense did not address the missing bank account, instead focusing on the time period of the following fiscal year’s audit, which was not completed at the request of Comfort House’s board. This came after Patterson’s August 2015 arrest. Defense attorney Ricardo “Rick” Salinas argued that a document attached to the Falcon account records reveals that at a Feb. 27, 2014, board meeting, Patterson was “instructed by the board to open a new business checking account listing her as the primary signee.” The account was used for daily operating expenses. Orendain countered that if the account was authorized, there was no reason not to produce it for the auditors. The second half of the day focused on testimony from two Chase Bank employees who worked at the branch where Knell was a customer. Jurors watched nearly 15 minutes of security footage showing Patterson and Knell meeting with a manager on Jan. 13, 2015, before being allowed to enter the bank’s privacy room to open his safe deposit box. This is an area where Chase staff is not allowed and where cameras are not installed. The witness, however, was unable to remember most of the conversation and had no knowledge of the contents of the box. All she could tell the jury was that Knell said he had “met a wonderful woman … he trusted with his life” — Patterson — and wanted her in charge of his accounts. Amador Lopez Jr., the manager of Knell’s branch, was then questioned about both the victim’s and Patterson’s bank statements. They showed that upon Knell’s death, Patterson — who was listed as payee upon death (POD) — opened a Chase account on Feb. 9, 2015, and withdrew all money from Knell’s account and deposited it into this account. His testimony also revealed Knell’s checking account had been flagged for elder abuse due to an Adult Protective Services investigation. Earlier testimony Wednesday disclosed that Patterson had initiated the investigation against Knell. After ensuring that Knell was “sound of mind,” Lopez agreed to release $150,000 in cash on Oct. 22, 2014 — after $100,000 had already been released Oct. 14. Another $150,000 was withdrawn Oct. 29 that same year for a total of $400,000 in the course of approximately two weeks. This is relevant in a civil suit that Knell’s family has filed against Comfort House, which received $150,000 in cash from Knell before his death. The family has also filed a civil suit against Chase Bank. Lopez also indicated that Knell’s son, Martin Knell Jr., was removed as POD from his accounts in May 2013 and that Patterson was added Jan. 5, 2015. Why Patterson was added as POD remains unclear and may never truly be known. It is also unclear whether Knell had planned to remove her at any point. At the end of a long day — the exhaustion evident on the faces of the judge, lawyers and jurors — Lopez said Patterson came to his office on her own volition in an attempt to explain her transfer of the money from Knell’s account into hers. However, Lopez said he had no reason to believe regulations hadn’t been followed with regard to the transfer of money. Patterson later returned to Lopez’s office to explain that, as per the advice of her legal counsel, she had to withdraw all money from the bank and give it to her attorney. “She was concerned,” Lopez said when describing Patterson’s behavior at the time. The defense did not have time to cross-examine Lopez, who is expected to return Thursday, along with other witnesses the prosecution will call to the stand.